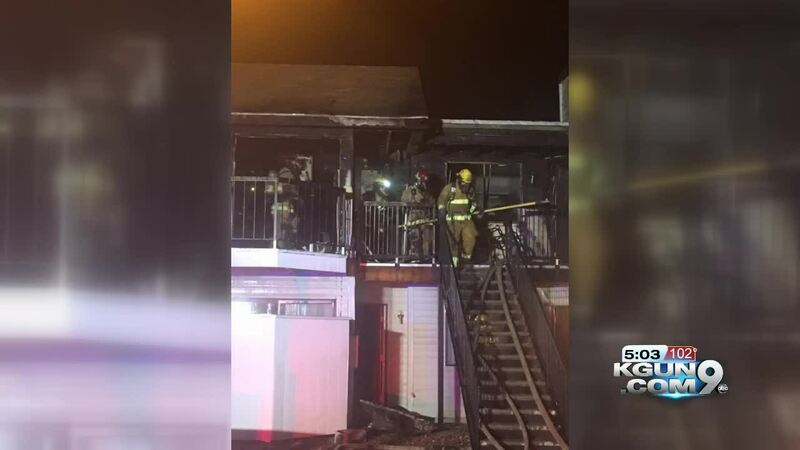 More than 40 Tucson firefighters responded to an apartment fire near Roger and Stone early Sunday morning. Tucson Police say 41-year-old Albert Maxam was arrested after the apartment fire for arson of an occupied structure, criminal damage, and endangerment. Two apartment units on the second story of the complex were fully involved in flames when the first crew got to the scene. Several firefighters evacuated nearby apartments and made sure all occupants were out of the affected units. After about 20 minutes, the crews had the fire under control. Four apartments were damaged in the blaze. The American Red Cross said they were at the scene caring for four residents who were displaced, and one resident was taken into police custody. A Tucson Police officer who was at the scene was taken to the hospital for precautionary reasons due to smoke inhalation but is expected to make a full recovery. No firefighters were injured. The cause and origin of the fire is still under investigation.